The situation became different after 1977 with the changeover to a presidential system, proportional representation and the establishment of provincial governments and their elections. By any measure, Finance Minister Mangala Samaraweera is Sri Lanka’s man for all seasons in politics. He has been in opposition to both UNP (1989-1994 and 2002-2004) and SLFP (2007 to 2014) governments. Equally, he has been a Minister in both SLFP (1994-2007) and UNP (2015 - ) governments. He has been a Minister, as well, under every President after 1994, and has had more than a hand in ending the presidency of two of them and is about to play the same role for the third and the current President. However, in the spirit of social camaraderie that cuts through political acrimony in Sri Lanka, all three Presidents and the Prime Minister showed up to concelebrate Mr. Samaraweera’s 30 years in politics at the BMICH. Quite simply, there is no one to match Mangala’s versatility and his political peer-popularity. 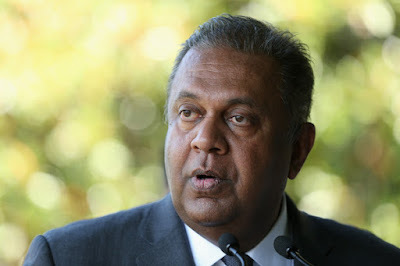 In the matter of inter-communal politics, or national reconciliation, Mangala Samaraweera is the most popular Sinhalese minister among the Tamils just as Lakshman Kadirgamar was the most popular Tamil minister among the Sinhalese. The elusive common ground is lying somewhere in between. The common ground that Mangala Samaraweera (MS) is now more urgently looking for is in the realm of the economy, to offer the largest amount of goodies to satisfy the largest number voters and their families or businesses in the hope garnering votes for the UNP and its allies in the upcoming elections. Which one? Economic commentators have advised the Minister against producing an election budget, cautioning about the long term economic pains involved in going after short term electoral gains. But no government or Finance Minister can ignore electoral and political realities in presenting an election year budget. The conventional economic wisdom of short term pain for long term gain, while it will not find any political traction in an election year, is also becoming questionable in light of the frequent ups and downs in national and global economies. What is more, austerity and belt-tightening are almost always undertaken targeting the more vulnerable in society, whereas the more consequential businesses who time and again trigger economic collapses are protected by governments from self-destruction because they are deemed too big to fail for the good of everyone else. This tautology is not applicable to Sri Lanka, where the private sector is not a big shaker of the economy and its role in the economy is defined more by fits and starts than by consistent policy framework of the government or by coherent responses of the private sector to market forces. In his new budget, the Finance Minister chose to differentiate the good segment of the private sector from its bad segment. The good ones are represented by "the genuine entrepreneur" competing in a "fair market", the "small and mid-size businesses that embody the spirit of Sri Lankan trade and commerce, and the Sri Lankan companies that compete on the global stage and win." The reprobates are the Rajapaksa favourites and the "beneficiaries of crony capitalism … walls of tariff … (and) inflated Government contracts." In a bit of bravado, the Minister declared: the latter group "is not the private sector that we want to see as the engine of economic growth, but (is) a vestige of a bygone era." The elections will determine who will be gone and who will return to power. But which election and that is the question. The next one and a half years are going to see a presidential election, a parliamentary election, and potentially quite a few or all nine provincial elections. We do not know if the Finance Minister and his advisers prepared a budget for any particular election, or for any and all elections. While an electorally appealing budget might tip the scales in favour of a reasonably popular government, no amount of budgetary inducements will be enough to help a chronically unpopular government win a national election. It is fair to say that until 1977, when we had the parliamentary system and the elections were based on the first-past-the-post method, no finance minister was able to produce a magical budget that could help a sitting government win an election. With the exception of the sitting UNP government winning the 1952 election, every sitting government was thrown out of office in spite of or regardless of the election year budget. So the argument that Sri Lanka’s economy has stumbled and stalled because of election budgeting does not hold much water. The situation became different after 1977 with the changeover to a presidential system, proportional representation and the establishment of provincial governments and their elections. Budgets became of even less significance – as governments in power manipulated the timing of elections and blatantly abused the resources of the state to win any and all elections for the governing alliance. In contrast to the fate of sitting governments before 1977, the governments after 1977 have been able to extend their stay in office beyond a single term simply by electoral manipulations and abuses of power. Their economic performance had very little to do with their relative longevity in office. Thus the UNP government elected in 1977 stayed on till 1994. And its SLFP successor lasted even longer from 1994 to 2014. The present government is in a peculiar pickle. It is a divided government. There is President Sirisena who is pre-occupied with staging his own ‘nadagama’ and seeking his own re-election. Then there is the parliamentary government of Prime Minister Wickremesinghe that includes Mangala Samaraweera as Finance Minister. In a presidential election, Sirisena and Wickremesinghe might be contenders, and while Prime Minister Wickremesinghe goes about claiming credit for whatever he considers as economic success, President Sirisena will be denouncing UNP economic policies and claiming that it was he who protected the country from being sold out by the UNP. Mr. Samaraweera’s budget will be criticised by his President who is also the Head of the cabinet of ministers. Whether it is the presidential election or parliamentary elections, the real contest will be between the UNP and the SLPP of the Rajapaksas. President Sirisena and his shrinking band of SLFPers will be put in their place even before the nominations are closed. The Samaraweera budget is full of ammunition to be used against the Rajapaksas in an election campaign. Without naming names, the budget blames the political crisis triggered by the Sirisena-Rajapaksa constitutional misadventure on 26 October 2018 for the country’s failure to take advantage of global economic changes towards the end of last year. But the October crisis also gave a political advantage to the Prime Minister and the UNP allies. The advantage has since been lost mostly. And the budget attempts to recapture some of that advantage by distributing generous handouts to please different sections of the population through 15 program avenues ranging from "Gamperaliya – Accelerating Village Development" to "Reconciliation through economic development". One of the 15 avenues is "Public Sector Service Delivery," which is nothing more than a euphemism for providing salary increases in the public sector, continuing the trend that was started in the present government’s first budget in 2015. The measure was ridiculed then as a ploy to win votes in the August parliamentary election. In that election the momentum was clearly with the UNP and the salary ploy may or may not have played any significant part. In fact, in the assessment of some UNP insiders the UNP failed to win a clear majority because of the Central Bank bond scandal. 2019 is a different political world entirely, and the salary increases are more likely to end as more money down the drain than assured votes in the ballot box. The fundamental challenge facing this government or any other government is not about finding a mix of economic measures to facilitate steady economic growth. It is about putting in place structures and institutions of governance to implement the different policies and programs for economic growth and social welfare. That was supposed the biggest purpose of this government. It has now become its biggest failure. The budget envisions an "Enterprise Sri Lanka – Empowering the People and Nurturing the Poor." Ideologically, this is trying to be all things to all people. There is nothing intrinsically wrong with it so long as there will be as many things as possible available as many people as possible. The budget may not have the long life it needs to test its own success or failure. The budget will soon become secondary to the main question about the sequence of elections that our political leaders will foist on the country. There seems to be growing interest among President Sirisena, Prime Minister Wickremesinghe and former President Mahinda Rajapaksa – to modify the existing presidential system along the lines of the JVP’s 20th Amendment proposal. That will eliminate the presidential election this year and will advance the parliamentary election from next year to this year. Provincial elections will have to slip through the gap one more time. The ideas around this move have been there for years. Only now they are germinating because it suits the selfish needs and political constraints of the three leaders. Each one has a major handicap in being a presidential candidate. So why not get rid of the damn presidency itself. That seems to be the motivation. Mahinda Rajapaksa is barred from running again. Gotabhaya Rajapkaksa is a problem candidate in many ways. Maithripala Sirisena can’t find anyone who will trust him as a candidate again. And after so many defeats, Ranil Wickremesinghe must surely be overburdened with self-doubt about his own chances again as a presidential candidate after 14 years. So it must make awful sense to them, cynically and severally, that it is best to modify the presidential system and get rid of the direct presidential election. Should these developments take place, Miathripala Srisena could have another term as President, but only as the Head of State and not the head of government. Ranil Wickremesinghe and Mahinda Rajapaksa will be left to duke it out in a parliamentary election. The budget and its effects may be forgotten by then. What might loom larger than any other spectre is what is going on in the courts - how the political actors will position themselves in response to what the police are finding and what cases are brought to trial. All three leaders have long thought that such a day of reckoning may never come. It may yet come and no one knows how that will impact any and all elections.